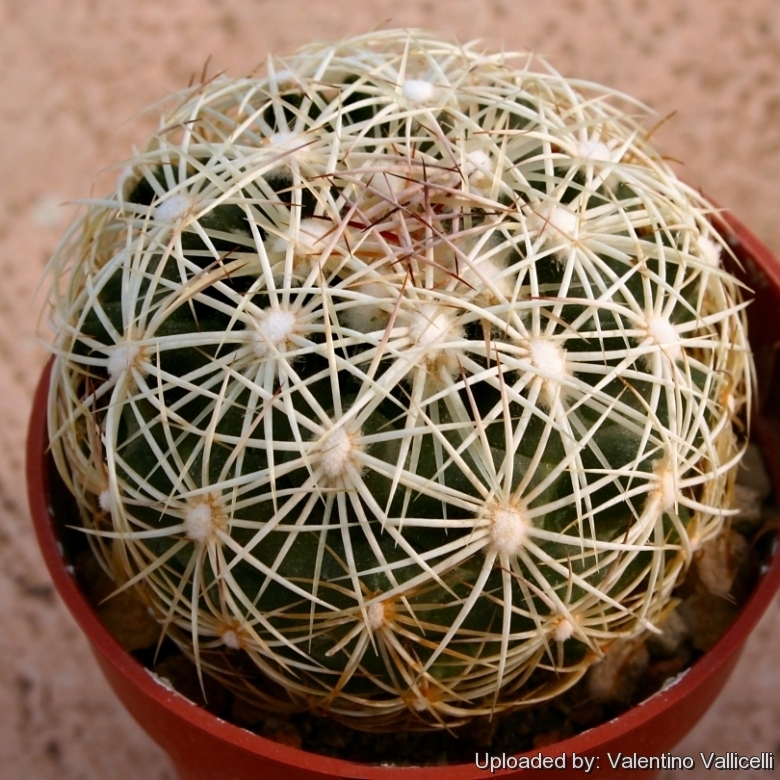 Origin and Habitat: Coryphantha compacta is a fairly widespread and very abundant species found in northwestern Mexico, where it occurs on the eastern slopes of the Sierra Madre Occidental (Chihuahua, Tamaulipas, and Durango). Altitude: 1400-2400 metres above sea level. Habitat: It appears to be very abundant in a variety of habitat comprising grasslands in sandy plains, volcanic soils in dry hills and pine forests in mountains. 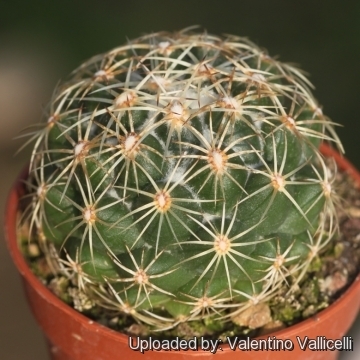 In the same area it is possible to find several cactus and succulent species like: Mammillaria wrightii v. wilcoxii, Mammillaria gummifera, Erythrina americana and Nolina texana. Land use change for agriculture may be a threat in places, but this is not having a significant impact at present. 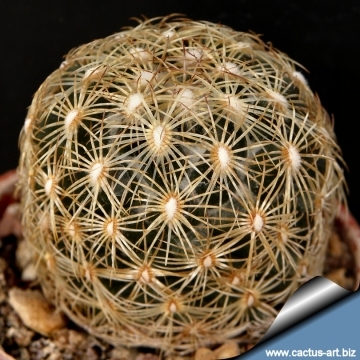 Description: Coryphantha compacta is a small, usually solitary species widespread over a wide territory in northwestern Mexico and therefore, very variable. It often shows only radial spines, but occasionally central appears. Stems: Globose somewhat depressed, pale grey-green to deep green, (2-)4-5(-6) cm high, (5-)6-8(-9) cm broad. Tubercles: Crowded, imbricate, in about 13 rows, 8-17 mm long and sulcate above. Central spine: Usually this species has no central spines, but occasionally it produces central spines, either on single areoles of a plant only, but also on all areoles. The central spines are stout, sharp, hooked, bent downward like cat claws, yellowish and usually dark brown tipped, reddish-brown when young and 8-20 mm long. The frequency of occurrence of the single, strong and curved to hooked central spine varies very much. from one population to another. 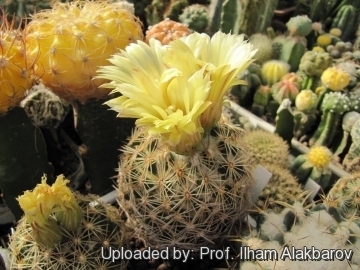 With the exception of the absence or existence of centrals, all the other characteristics are absolutely identical, namely size and form of tubercles, number, size and arrangement of radial spines, flowers, fruits and seeds. Furthermore this species is one of those Coryphantha which pass a purely radial-spined long youth stage in which they are already floriferous. Some of the plants after several years develop the central spines, giving the plant its sea urchin appearance. Radial spines: 11-16, rigid, appressed, flattened against the stem surface and interwoven, white to yellow, 10-20 mm long. Flowers: Yellow, to 2 cm long and in diameter. 5) Dicht, R.F., Lüthy, A.D. & Goettsch, B.K. 2013. 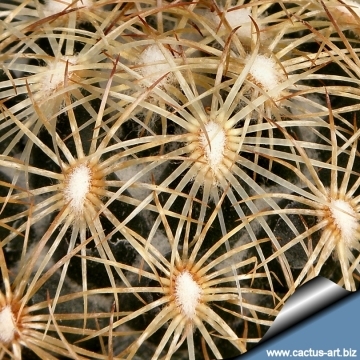 Coryphantha compacta. In: IUCN 2013. "IUCN Red List of Threatened Species." Version 2013.2. <www.iucnredlist.org>. Downloaded on 16 January 2014. Traditional uses: Used by Tarahuma shamans as a kind of peyote.